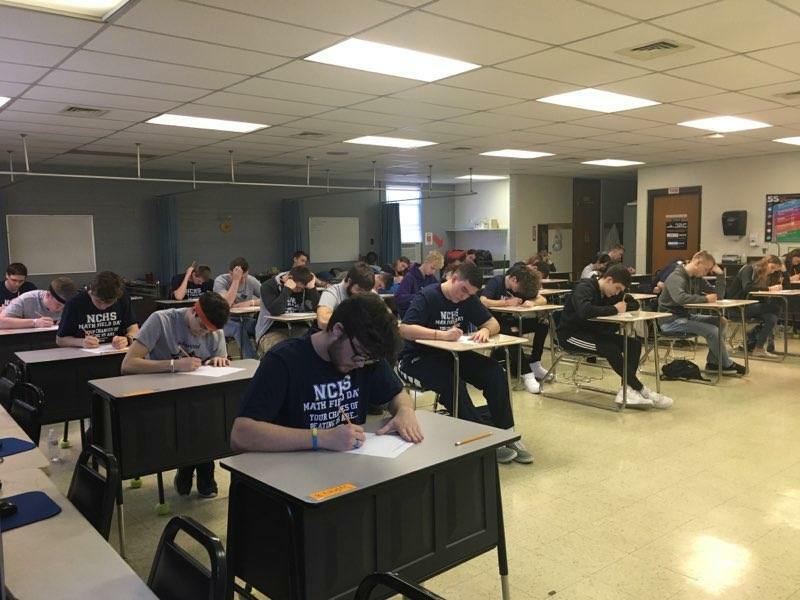 Nicholas County High School – NCHS won first place as a team The Nicholas County Math Field Day which took place at the Nicholas County Career and Technical Center in Craigsville, West Virginia, on February 21, 2018. The County Math Field Day participants from NCHS were Kyle Barker, Eamonn Payton, Andrew Cook, Owen Devine, Devin Hamrick, Gabriel Collins, Caden Phipps, Quinten Jeckering, Josie Chapman, Nathaniel Hall, Braden Hornsby, Olivia Stear, Taylor Brown, Gavin Foster, and Amanda Ward. NCHS’s County Math Field Day winners were Eamonn Payton (First Place), Caden Phipps (Second Place), Kyle Barker (Third Place), Devin Hamrick (Fourth Place), Owen Devine (Fifth Place), Quinten Jeckering (Sixth Place), Braden Hornsby (Eighth Place), Andrew Cook (Ninth Place), Olivia Stear (First Alternate), Nathaniel Hall (Second Alternate), Gabriel Collins (Third Alternate), and Amanda Ward (Fourth Alternate). Nicholas County High School won first place as a team at County Math Field Day. The Regional Math Field Day was held at the New River Community and Technical College Campus in Lewisburg, West Virginia on March 23, 2018. NCHS’s Regional Math Field Day participants were Eamonn Payton, Caden Phipps, Kyle Barker, Devin Hamrick, Owen Devine, Quinten Jeckering, Braden Hornsby, and Andrew Cook. The Regional Math Field Day winners in order of place were Eamonn Payton (Third Place) and Andrew Cook (First Alternate). Caden Phipps won the award for predicting how many jelly beans were in a jar. The WV State Math Field Day was held at Marshall University campus in Huntington, West Virginia on April 22, 2018. The State Math Field Day participants representing NCHS were Eamonn Payton and Andrew Cook. The NCHS Math Field Day participants plan to go into many different careers including engineering, biochemistry, and forensic science. The hard work that these students have demonstrated throughout this endeavor will shows not only their skill in the arena of mathematics, but their willingness to succeed. Math Field Day allows students show off their math problem solving abilities. The students answer eight short answer questions along with four questions on the written test to generate their individual score. The students answer ten team power questions along with ten team free response questions to generate their team score. The Regional and State levels of the Math Field Day competition have a Team Relay Event where students form teams of five and each student answers parts of the math problem to arrive at the final answer as a team. “I am glad to see that all of the students have worked hard,” said Mr. Fox.